This is one of the toughest workouts I have ever done. It puts your cardio, strength and endurance to the test. The workout itself is something that you should acclimate yourself too. Don’t expect to go all out and be able to complete this type of training, unless your used to it. What makes it truly challenging is the use of time as a measurement instead of reps.
To put it into perspective curling 25 lbs for 10 reps resting for 60 seconds than repeating the reps is a lot easier, than curling 25lbs for a minute straight doing as many reps as you can. 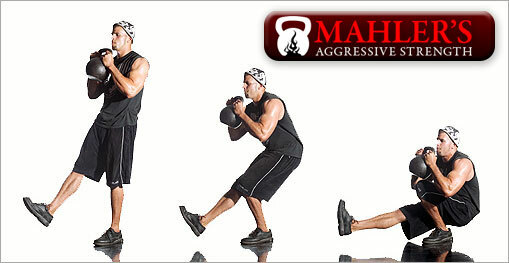 This puts your cardio to the test gets the blood pumping right away. Resting for 15 seconds before moving to the next exercise gives you a chance to catch your breath. My advice for anyone starting out is, lift light at first trying to do as many reps within a minute. Men’s Health suggest that if you cannot complete the exercise for the full minute do 15 to 20 reps instead. The amount of weight you should lift according to Men’s Health is weight that is challenging, which basically means you should be able to lift it for a minute. I have done this workout with two other gym mates, one threw up and wasn’t able to complete the routine. The second almost fainted three exercise in. As for myself …When I first started this routine I was able to complete some exercises for the full minute. 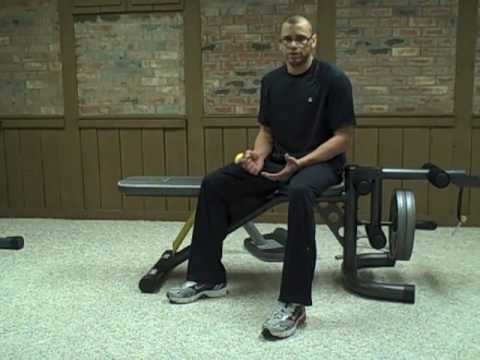 Other exercises I would revert to reps instead. Other tips to getting the most out of Spartacus Workout. 1. Rest – Men’s Health suggests that you do this routine three times a week taking a day off in between workouts. 2. Keep pushing yourself if you can do a minute at ten pounds move it up to fifteen. By the second circuit I am soaked in sweat and pumping to the music to get through. To date I have done this routine 12 times. Here is where I am at from the date I started till the present. I am amazed at the results. EVERLAST ADVANCE FREE STANDING REFLEX BAG. The EVERLAST Reflex bag is fun and easy to set up. It will give you a great cardio workout, develop your speed, timing and focus. It’s great for places where you can not install a double ended bag. I filled it up with two 40 gallon water bottles it started to leak from the top, basically because I over filled it. Be sure if you are filling it with water not to fill it to the top. It takes up to 60lbs of water or sand. I had it for three weeks no problems, I punch and kick it use it for my martial arts training. It does need to be tighten every once and in a while, then again any equipment you use on a regular basis should be checked and tighten. Another huge plus is my kids love it! Freestanding, spring mounted design helps develop speed, timing and punching accuracy. 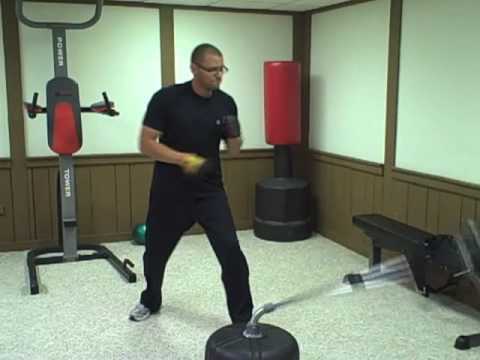 Rebounding bag to help improve reflexes and bobbing and weaving movements. Ideal for hand-eye coordination, upper body and core workouts. Easy-to-fill base (fill to 60 lbs. with water or sand). Adjustable height. Synthetic leather construction. I had purchased mine from sports authority it does not show up on their site . Cost around 50 dollars on sale, 59.99 regular price. Gold’s Olympic Bench Set XRS 20. It is a great bench, it has some minor draw backs but those can be over looked considering what your get for the price. 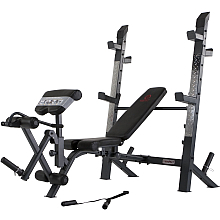 The XRS 20 is a beginner to intermediate bench set. Adjustable Uprights can be adjusted to a number of positions for various exercises and comfort levels. 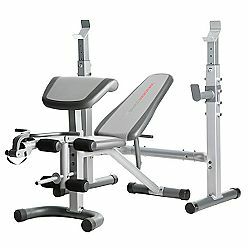 Sears has a comparable Joe Weider set they look basically the same. Sport Authority sells a model that has a walk in squat station. The bench is not free standing. They are versatile,effective, and economical. Powerblocks will save you room and some cash. At the same time you are getting a well made and design piece of equipment. I would suggest these any day over conventional dumbbells. 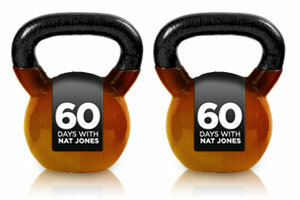 The product also can be fitted with a bar to workout with as you would a standard Olympic weight set. I wasn’t in that mind set however when I brought them. 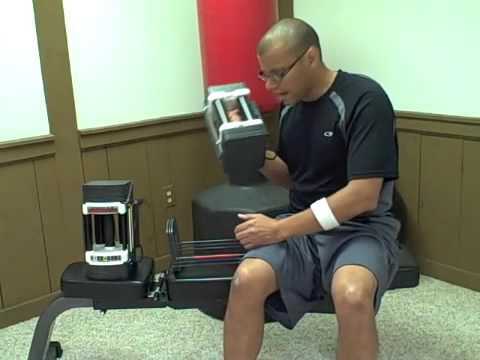 Click to get more information on power blocks here.